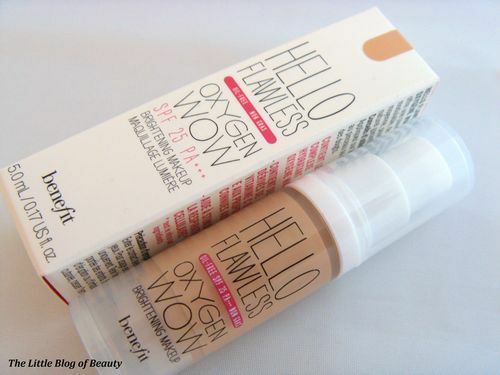 I received a sample of Benefit’s Hello Flawless Oxygen Wow Foundation* when I attended the Benefit Bristol Fakeup event. This is a good sized sample in a cute mini version of the bottle that the full size product would come in. This is an oil free brightening foundation which is light to medium buildable coverage. This also contains broad spectrum SPF 25 and PA***, which is the highest protection available for UVA. I was given Ivory (believe in me) but I think this is just slightly too dark for me. This appears to be the lightest shade available on the Beauty School ‘find your match’ page on the website but if the colour swatches on the product page are true to shade I would say I’m more Ivory (I’m pure 4 sure). I’m not a fan of light to medium coverage as I have a lot to cover and so usually prefer medium to full coverage. However, for my good days when there is less to cover up, I do like this. This applies nicely and provides a natural dewy finish. This holds up reasonably well on most areas of my face however after a couple of hours my chin starts to get oily (it always does this, for some reason it tries to budge my makeup) and this does start to slide off. As I’ve said for my better days I do like this and I think it would be good in the summer when I might want lighter coverage and a more summery glowy look than I get from my usual compact powder foundation. 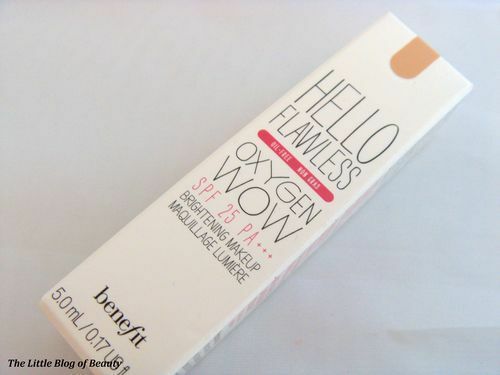 Benefit Hello Flawless Oxygen Wow foundation is £23.50 and is available from Benefit counters and the Benefit website.